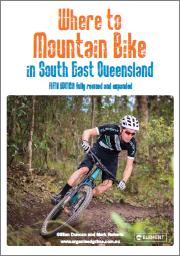 Two years ago I asked a few friends if they knew of any way to ride a bike from Cedar Creek (a few kilometres north of Samford) up to Mount Glorious. 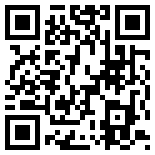 At the time, no one had any clear ideas about how to do it. 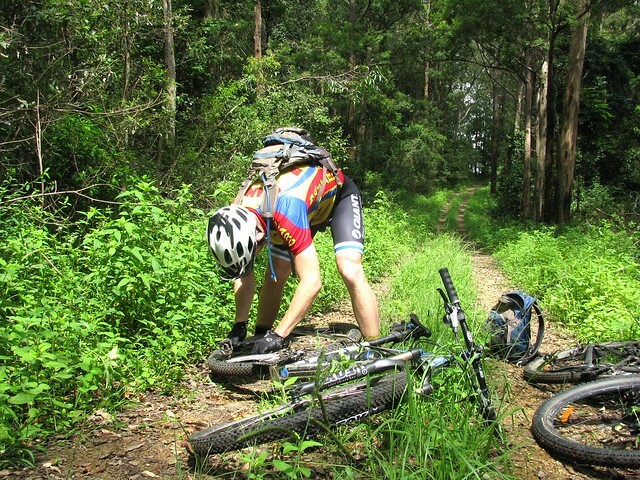 But today we found a challenging way to go the other way, riding down to Cedar Creek from Mount Glorious. Tony, Graham and I started the day from Samford, heading west to the D’Aguilar Range via some local Pony Trails. 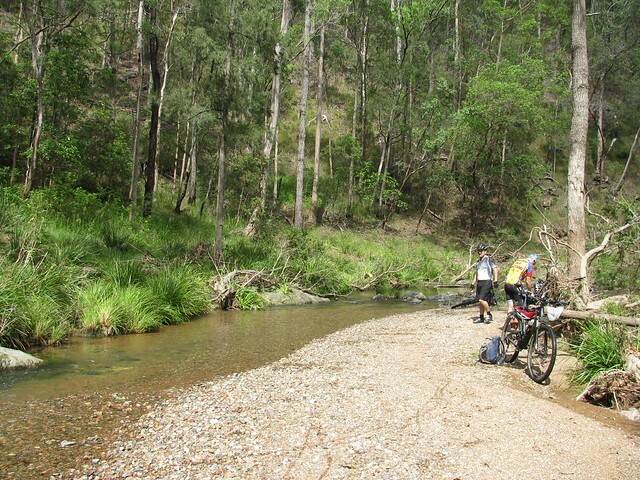 We made our way up the hill to the Dundas Road water tank and campsite before taking a long descent down Goodes Road. Goodes Road descends almost 500 metres in 4.5km. That’s a long way down in a fairly short distance. It’s a lot of fun to ride down, provided you keep your wits about you. It’s very hard work to ride up. After the long descent we eventually we reached England Creek. This beautiful clear creek meanders westward through the National Park eventually draining into the Brisbane River near Fernvale. Today it was full of beautiful fresh water. Tony and Graham rode through it effortlessly. 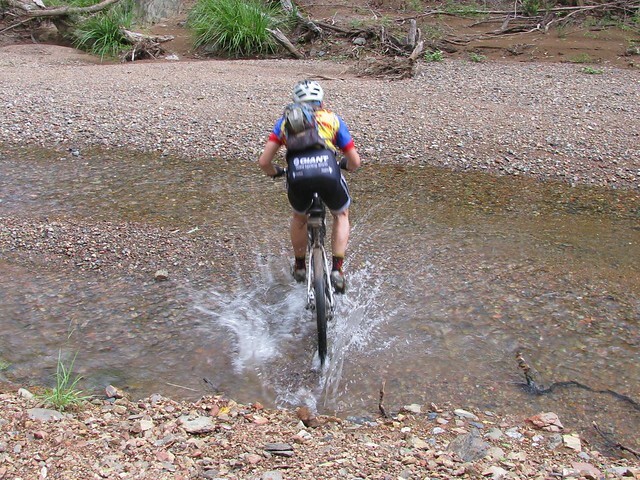 I however, stalled midway through, fell off and got totally saturated. Since England Creek marks the bottom of the descent, and the start of the long climb out, we decided to take a quick break. Graham broke his chain while riding up Joyners Ridge Road, and didn’t have a spare link or chain breaker with him. Luckily I did, so he was able to get back on his way fairly quickly. The only problem was that leeches found us while we stopped in the damp undergrowth, so we all had to pick off a few of the horrible little creatures before setting off again. The climb up Joyners Ridge Road from England Creek is about 10km in length. But during that time we had to make a total ascent a total of 835 meters. So by the time we got to the top we were quite hot. 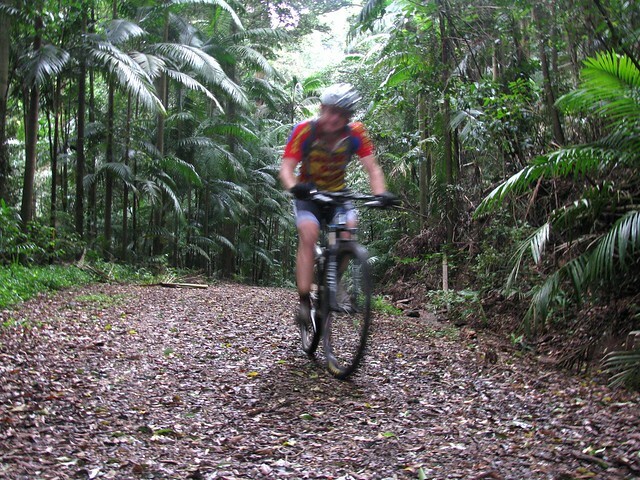 So the cool rain-forest at the top of the climb was a delight to ride through. After a quick break at Mount Glorious, we headed east along Harland Road, past an old saw mill near the summit of Mount O’Reilly to look for a way down the mountain. Harland Road is beautiful to ride along. It slowly gets narrower and more overgrown until it eventually disappears completely. At this point we just steered the bikes down the hill along what appeared to be a ridge-line until we could no longer ride, and had to walk the bikes, scrambling down some very steep hill sides. My predefined route was useless at this point. It went off over the side of the hill through terrain that we would never have been able to negotiate. Eventually Graham found a rough 4wd track. Rocky, and overgrown, it was still too rough to ride, but it slowly improved until we were able to finish riding down the hill. 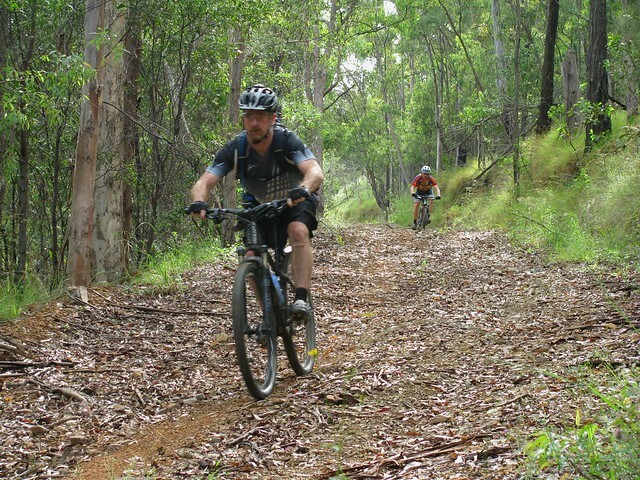 Well – we probably walked about 600m of it, but we did ride the rest. All up, 55km, 4,300kcal and 1,600m of vertical ascent. This one rates a definite 10 out of 10 on the tough-o-meter. 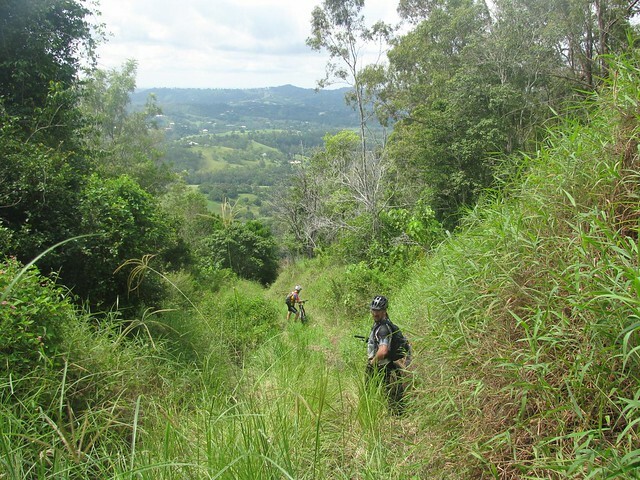 Just doing the Goat Track, Dundas Rd, Goodes Rd and Joyners Ridge Rd is difficult. But adding Harland Rd into the mix, and scrambling through some thick undergrowth to get down a steep hill side made it insane (but fun). 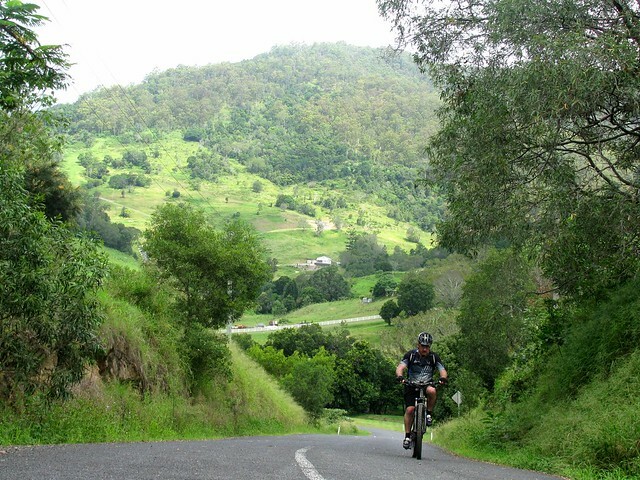 Only try the Harland Road part of this ride if you’re willing and able to scramble down some very steep, overgrown, rocky hill sides carrying your bike. Don’t try it solo – it’s too dangerous to do alone. So was the last scramble via private property? Yes, I think so. But towards the bottom the trail is clearly marked and it comes out at Cedar Creek at the top of an undeveloped block of land.